You can tell them about how to treat others, but they are watching you and learning from how respectful you actually are with the people around you. You can tell them about how to cope with pressure, but they will learn more from the strategies that they see you use when you’re feeling stressed. You can tell them about reaching for their dreams and having fantastic jobs when they get older, but if they see you go to a dead-end job that you hate and hear you complaining about work without seeing you do anything to change it, they’ll see that as normal and will limit their aspirations. You can tell them until you are blue in the face about principles that you want your kids to learn. But, like it or not, they aren’t listening, they’re watching. It’s a massive responsibility and a massive opportunity. 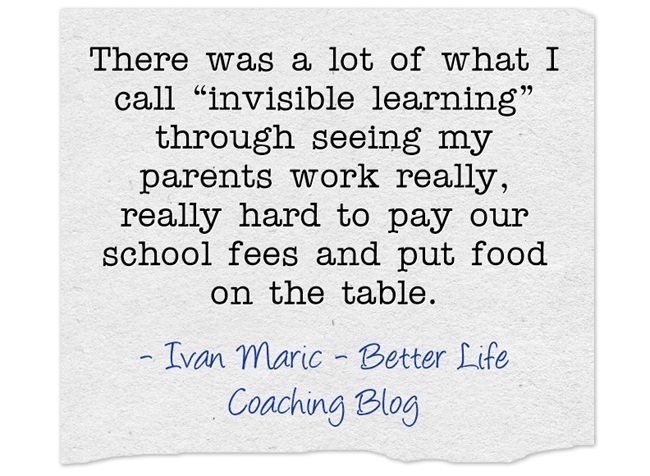 So, let me ask you, what are your kids invisibly learning from you today? Previous post – Is It Time To Open Your Gifts? Thank you I needed to read this today! Some very important points here. Kids are always learning from you – whether you’re giving them good lessons or not. You have to be conscious of how you’re behaving when around children. « Is It Time To Open Your Gifts?